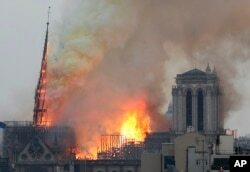 A major fire on Monday began to burn at France’s world-famous Notre-Dame de Paris Cathedral. The cathedral is one of the world’s most famous tourist sites. About 12 million people visit Notre-Dame each year. It sits in the center of Paris, along the Seine River. The mayor of Paris, Anne Hidalgo wrote on Twitter Monday, “A terrible fire is underway at Notre-Dame Cathedral in Paris.” Hidalgo added that Paris firefighters were still trying to contain the fire. She urged people to stay away from the area. Notre-Dame’s first stone was laid in 1163 by Pope Alexander III. Its main spire was added during repairs in the 19th century.